FutureVision?! Which life do we want? If you are looking for and creating the next impactful advances in technology, social practice or natural science, we would love to feature you, to connect you, to promote you. What do you see? And what are we able to co-create for future oriented life concepts and thrivable ecologies? 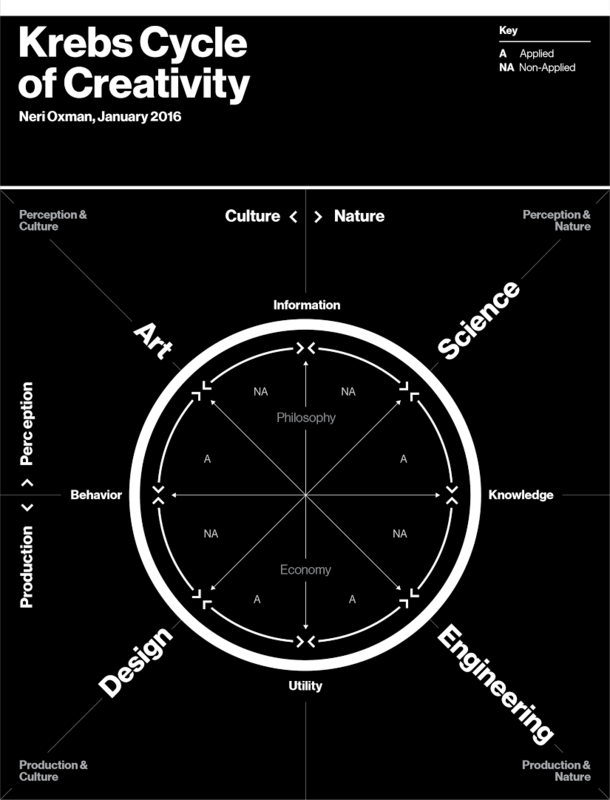 Concepts and applications may include but are not limited to contributions from philosophy, science, engineering, economy, design, and art, and any convergence of these disciplinary foundations with a systems perspective. The Krebs Cycle of Creativity is a map that can help you answer the question of your submissions positioning. Source: Oxman, N. (2016) Krebs Cycle of Creativity (KCC). In: Ito, J. Design and Science. Can design advance science, and can science advance design? http://www.pubpub.org/pub/designandscience, last modified date: 13.01.2016. For those who might not yet be in-depth experts in Systems Science: Cybernetics and Systems Science have shaped the world we live in today. Many of the technologies, organizational structures and social systems we know and we are used to, have been influenced by insights from the so called Systems Sciences. The term “Systems Science” is meant to denote every scientific endeavour that deals with systems and connects to the term “systems”; thus it includes disciplines such as systems engineering or systems thinking and systems philosophy. In the perspective of Philosophy, contributions how we deal with information and the consequences of our information concepts, which enable or constrain our perception of the world. Which life we really want, is an ethical question first hand. In the perspective of Science, contributions that are showcases of new knowledge and methods of knowledge production at the frontier of the scientific body of knowledge may it be in natural science, social science or humanities, and critical assessments of scientific endeavours, their impact on our life concepts. In the perspective of Engineering submissions addressing advancements and never before seen innovations in technological systems and their interaction with social systems. Our current paradigm of innovation is still driven by technological progress. Thus we are looking for the conscious innovators. In the perspective of Economy, submissions which address alternatives of utilization of technology and scientific knowledge. In a world of limited resources and increasing disparities we need to reconsider our economic concepts and applications. In the perspectives of Design and Art, contributions which have the potential to shape our perceptions and behaviours for future oriented life concepts. Calls for submissions are open until 19 February, 2016! The closing date cannot be extended. You need to submit an extended abstract in PDF format. The minimum length of the text body of a submission is 1 page, the maximum length 3 pages (that is, between 750 and 2000 words). 1 to 3 pictures may be added for illustration (not larger than 3 MB in total). Please do not forget to mention your contact data and affiliation. Authors of the extended abstracts are expected to add their bio narrative (a quarter of a page). All extended abstracts have to be submitted via emcsr.avantgarde@bcsss.org. In case your submission is a video work please send us the file. If it is over the length 10 – 15 minutes, please send us a trailer or a link to a trailer that gives an overview of the work (2 minutes long maximum). In case your submission is a game please send us a trailer or a link to a trailer that gives an overview of the game (2 minutes long maximum). Submitters will be notified of acceptance or rejection until 4 March, 2016.